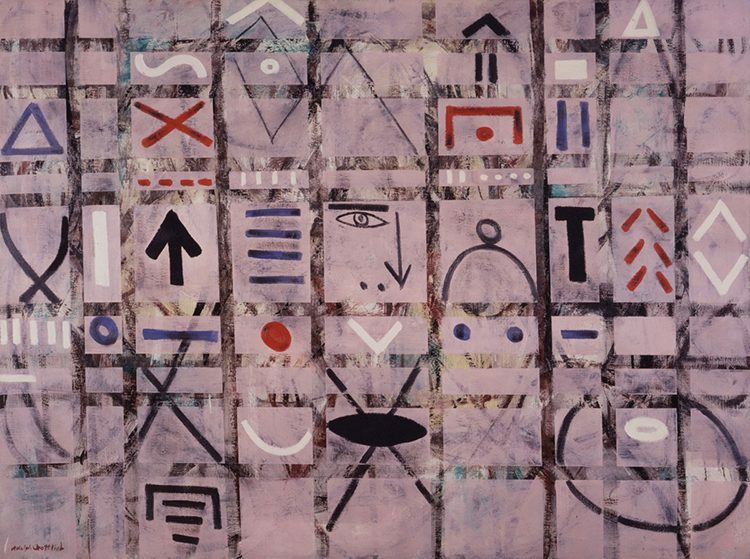 The theme of my playlist is eclecticism to reflect the wide range of symbols and techniques employed in Adolph Gottlieb’s Labyrinth #1. Gottlieb once remarked, “The surprise in a painting is not the surprise of discovering some kind of a story or myth, it’s the surprise of finding a clear statement about something that you felt and then to see it, to see this feeling become materialized in paint, then it really exists.” My inspiration drew from delving into the terms “labyrinth,” “alchemy,” “pictograph,” and “symbol”; looking at what music was playing at the time of this painting in 1950; and music-based mash-ups. I would recommend playing this on shuffle to reflect the surprise Gottlieb describes. This entry was posted in Exhibitions, Experiment Station and tagged 1950s, Adolph Gottlieb, art and music, Paul Klee, playlists, polyphonic rhythms, shuffle, songs, surprise, Ten Americans. Bookmark the permalink.